While there for a quick weekend trip, we hiked Charlies Bunion trail. Charlies Bunion is named after Charlie Conner, one of the early proponents for a national park in the Smoky Mountains. While he and his hiking partner were out one day, they paused for a rest of the rocks. Conner took off his shoes and socks and there was a bunion that resembled the rocks they were pausing on. Kephart told him he would put this place on a government map for you. And he did. Charlies Bunion is 8.1 miles roundtrip and is part of the Appalachian Trail. While hiking, you can see both thru-hikers (meaning they are hiking the entire AT) as well as section hikers (they are only hiking a section of the AT). The hike is strenuous and goes uphill, downhill and uphill again. The walk back is not any easier! The views are phenomenal. Looking at both North Carolina and Tennessee at the same time. There is also a short side trail to visit the Jump Off, a one-mile roundtrip journey that is nicely marked. 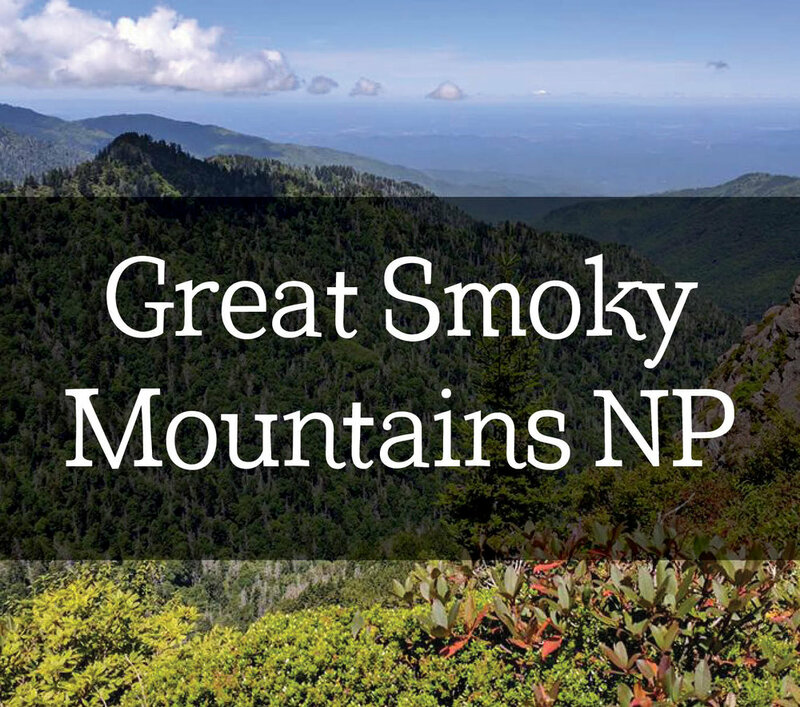 How to Get There: From the Sugarland Visitor Center, drive 13 miles south along Newfound Gap Road to the Newfound Gap parking lot. What to Bring: Plenty of water, snacks and even lunch. We started hiking around 10, arrived at the top around 12:30 to have lunch and a break and hiked back. We were back to our campsite at 4:30. The day we arrived in the Smokies, we decided to do a 6-mile hike. In the rain. I really wanted to see waterfalls, so sue me! The Rainbow Falls trail is fairly traveled and follows LeConte Creek. There are both log and footbridges to get to the falls, so travel carefully. The falls themselves are 80-feet tall and freeze up in the winter. Unforteunly for us, the rain got to be too much, so we ended up going only 2 miles before turning back. How to Get There: Take the Historic Nature Trail Drive (you have to drive through Gatlinburg for this) into the park. Rainbow Falls has their own parking area. What to do Afterwards: If you must stop in Gatlinburg, check out Nantahala Outdoor Center. We hung out here when the rain got to be too much and they have a large selection of patches, gear, clothing and shoes. Our campsite at Elkmont Campground ended up being right next to a rushing river called Little River. It wasn’t very deep, so you were able to wade in it and could even take an inner tube down it (you might get stuck on the rocks though). We spent a few hours soaking our sore feet after our hike up Charlies Bunion in it. There were plenty of additional spots along the Little River Road to pull off and wade into the water, so an overnight stay at the campground is not needed. What did your Smoky Mountain trip look like? Did you backcountry camp and hike? If we had a few more days we would have hiked a larger portion of the trail! Sign up in our footer to win a limited edition Hashtag 59 8x11 Framed Print Shipped to your house!